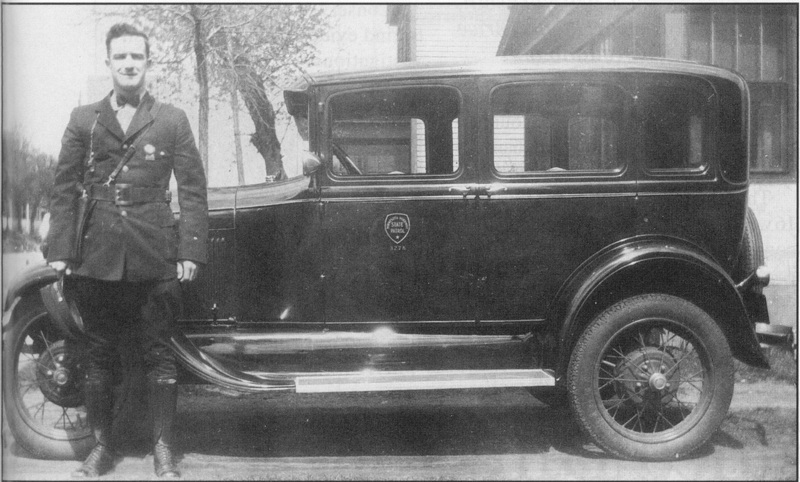 The Ford Model A was selected as the very first car of the Minnesota Highway Patrol. The Model A was manufactured in St. Paul. The cadets of the first Highway Patrol academy attended hands on training at Ford's Twin Cities Assembly Plant so they could perform their own vehicle repairs and maintenance. 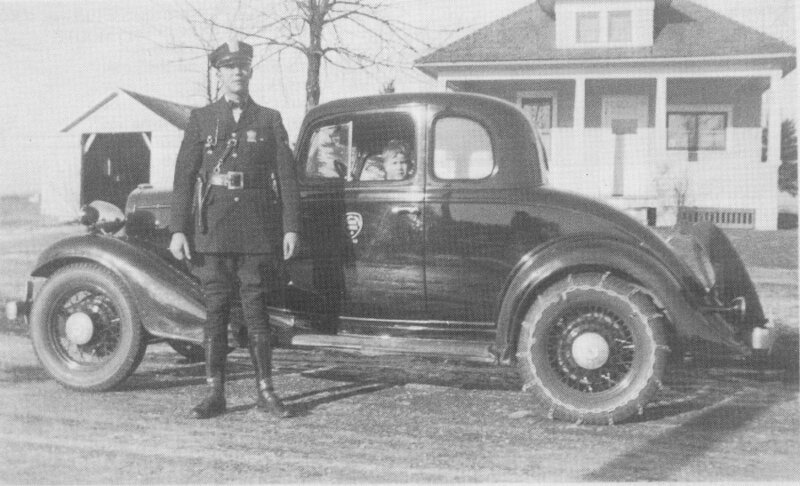 This 1934 photograph shows Patrolman Robert C. Newmann with a 1930 Ford Model A Coupe. The Model A was equipped with a 40 hp 4-cylinder engine and 3-speed transmission. They had a top speed of 60-65 mph and sold for about $530. Photo courtesy of J. Hansen. A replica of the early Highway Patrol cars, this Model A is the MSP Troopers Association's reproduction pictured at an event in May 2015. The car is available for shows and displays upon request. Call your local Minnesota State Patrol headquarters or email a request if you would like the 1930 Ford displayed at your event. Unfortunately, I am unable to identify the patrolman in this photograph. 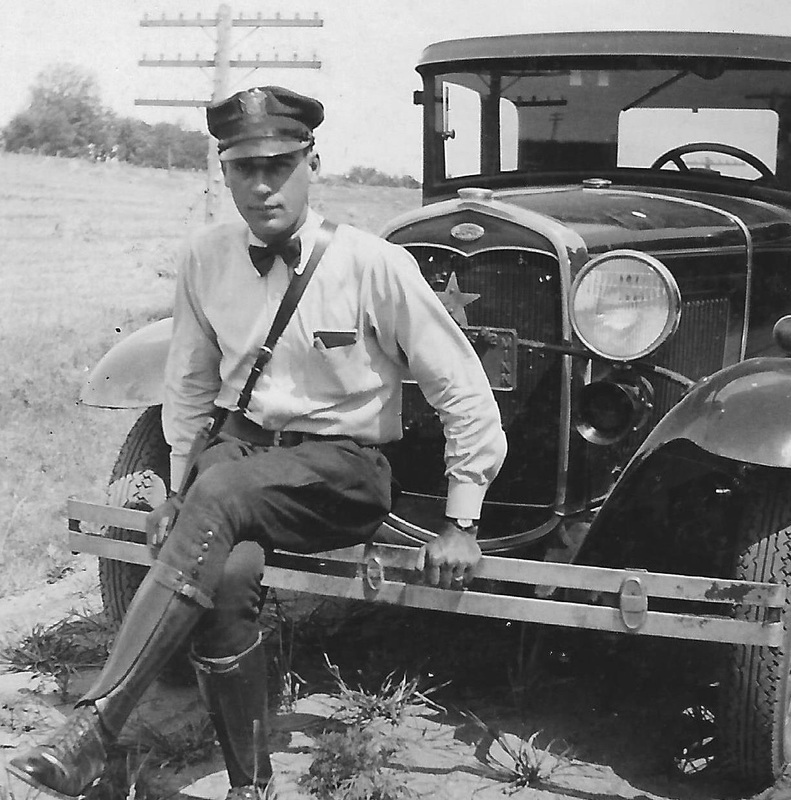 However, that is a 1931 Ford Model A patrol car he is resting on. Photo provided by the family of William Marquardt. Ford was building V8 engines by now, but Chevrolet continued to build a reliable inline 6. The valve in head 1933 Chevrolet Master Six displaced 194 cubic inches and was rated at 65 horsepower. They used a 3-speed manual transmission and a 4.4:1 rear axle fitted with 5.25 x 17 tires. They were said to have a top speed of around 70 mph. This example is pictured with Patrolman Hieronymus "Ron" Ochs. 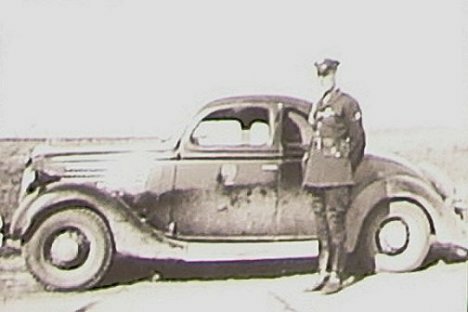 Adolph Rosetter was appointed to the Highway Patrol in 1934. Here, Rosie is pictured with a 1935 Ford Coupe. In this photo, you can clearly see the star light that was illuminated while patrolling at night. The red lamps mounted on the fenders would be mounted at the upper corners of the windshield in later years. About this time, the Highway Patrol began equipping the units with a fender mounted STOP lamp, which is visible behind the right headlamp. Photo provided by the Adolph Rosetter family. ​The patrol car pictured here is a bit of a unicorn. Pontiac offered three model lines for 1935. The lack of fender mounted front turn signal lamps and what appears to be a straight front axle are indicative of a Standard Six model. The Standard Six sat on a wheelbase of 112 inches and was equipped with a 208 cubic inch, 80 hp L-head six, a 3-speed manual transmission and a 4.44:1 ratio rear end. The Standard Six was fitted with 16 x 6 balloon type tires on spoke wheels. It is difficult to tell, but it appears this one may have the DeLuxe model’s artillery wheels. Four-wheel hydraulic brakes were new for Pontiac in 1935. 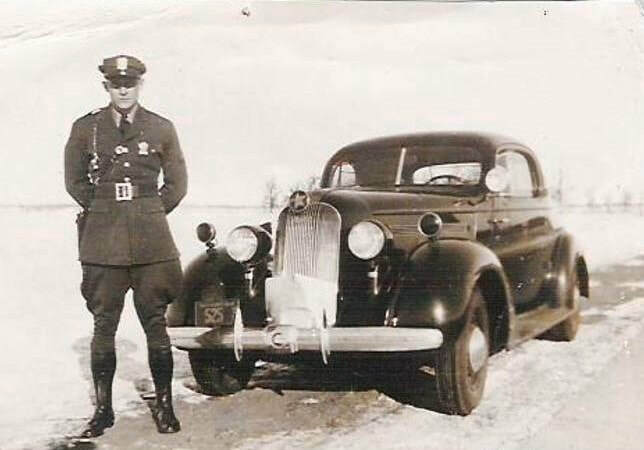 Ray F. Krueger, Badge #30, was appointed to the Highway Patrol in May 1934. 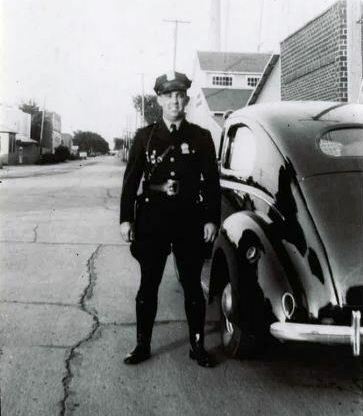 Patrolman Krueger died in November 1959 from injuries sustained in an on duty traffic crash that occurred when another motorist turned in front of Officer Krueger's patrol car. Alex J. Keilen is pictured with this 1936 Ford 5-window coupe. The 1936 Ford was equipped with a 221 cubic inch flathead V-8 that produced 85 horsepower at 3800 rpm and 153 lb-ft torque at 2200 rpm. The engine mated to a 3-speed manual transmission and a 4.33:1 rear axle. Ford still used mechanical brakes on all of their cars in 1936, insisting the system’s simplicity made it more reliable than the competitors’ hydraulic brakes. The 1936 body was a carryover from the 1935 model. But, new for 1936, were the stamped steel "artillery" wheels. Photo provided by the Alex J. Keilen family. 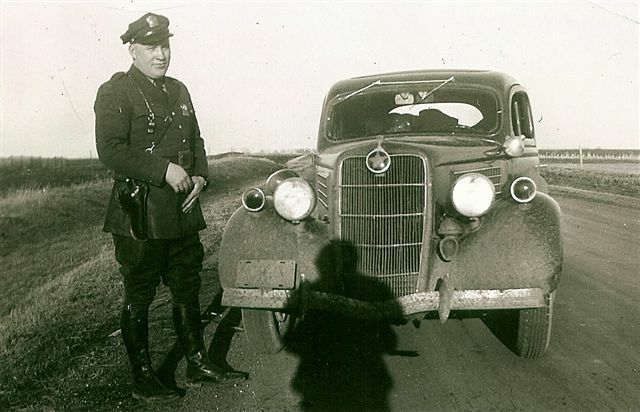 Patrolman Mylon Sheehan, Badge 116, is pictured above with a 1938 or 1939 Ford. Sometimes in the car world it's difficult to tell one year from the next. Either way, this one fills in another blank in the MHP history. The photo was taken in Willmar, MN, in 1940. Patrolman Sheehan served 1940-1941. Photo provided by Patrick Sheehan. The 1940 Ford was equipped with the “star light” and a massive driving light. The Highway Patrol continued to equip their cars with the fender mounted STOP light through 1968. Patrolmen would drive alongside the violator’s car and activate the light to signal the violator to stop. Sealed beam headlamps were new for 1940.